The arrival of winter means biking outside takes a different approach. 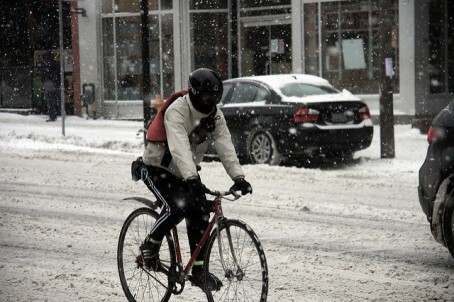 It’s possible to bike safely out there during the cold winter months. One of the things that is essential is knowing what to wear and how to dress for the cold weather and wearing appropriate winter biking gear. And so, here are some tips on what to wear to keep you warm (and comfortable) during that winter ride. Keep in mind, varying levels of cold weather may call for varying combinations of the type of clothing you choose to wear. When preparing for a ride out in the cold, you’ll want to think about protecting and keeping warm your core, head, hands, legs, and feet. Below you’ll find expanded tips for a few of these. Just as getting too hot while out biking in the summer can have serious consequences, so can getting too cold while out biking in the winter. For this reason, it’s not a bad idea to always carry an extra layer just in case. Layering clothing is the most effective way to dress in cold and wet conditions. This way you can peel off layers as needed as your body temperature changes during your ride. In cold weather, three layers work well to combat the winter conditions. With each of the layers comes a different purpose, and it allows you to adjust your clothing as your bike ride continues. Together, these layers are designed to wick, trap, and block. The purpose of the layering is to ultimately hold the heat near your body to keep you warm. These are some ideas for layering. This layering system also allows you to easily adjust your clothing if you become too hot or too cold. Don’t hesitate to stop and adjust your clothing, whether it be putting on an additional layer or taking off a layer of clothing. Depending on just how cold and windy it is out there, you may want to add more than one article of clothing for each “layer” that is described. Start with a base layer that is made of lightweight and high performance wicking material. You want this layer that is closest to your skin to help move moisture from your sweat away. By wicking away your sweat, this base layer will help keep you dry, and as a result, you can be more comfortable during your ride. Say NO to cotton which will absorb the moisture of your sweat. You’ll feel like you’re wearing wet clothing as the dampness sticks to your skin. That might make for an uncomfortable ride. Look at these for your base layer for top and bottom. The next layer you want working for you is a breathable insulation layer to keep you warm. You want this layer to be slightly looser than your base layer so you can trap the air near your skin. Dry and still air can provide insulation, and this trapped air can help to retain warmth near your body. Depending on how cold it is, you might want a few extra layers here. But remember that you’ll heat up as you’re biking too. Look at some of these for your insulation layer. If it’s really cold, you might consider also wearing this type of layer too. For your outer layer, wear a jacket, preferably one that is resistant to wind and water. You’ll want to make it lightweight and breathable so it will allow perspiration to escape while at the same time breaking the wind and keeping you dry from external elements. This outer layer serves to hold the warmth in while blocking out the cold wind. Look for a jacket that is long enough in the back so that when you’re riding, your back side isn’t too exposed to the cold air. Jackets with adjustable wrists are also helpful, so you will be able to control the tightening around the wrists to avoid wind exposure there. Take at look at some of these jackets for biking in colder temperatures. Proper head wear while out cycling during the winter can help greatly in keeping the rest of your body warm, as a lot of your body’s heat can be lost through the head. So keep your head warm to keep your body warm! Depending on how cold it is when you go out biking, you’ll want to change up your strategy for how much cold weather protection to give your head. Here are some options to keep your head from losing heat during your cold weather bike ride. Pick and choose and mix different options depending on the weather conditions and your preference! A traditional cycling cap like one of these can work in cold and wet conditions. A windproof and lightweight cycling cap that you wear under your helmet will help to retain some heat in your head. The cap can help from keeping too much heat escape from your head, while the visor can help keep the precipitation from getting into your eyes if it’s a rainy or snowy day. If it’s really cold, consider opting for a fleece winter skull cap that covers the ears like one of these to maximize heat retention and so you can protect your ears against the cold wind. Depending on the type of cap you get, the helmet straps can hold the ear flaps down to keep the head warm. If there’s no precipitation in the forecast, maybe consider wearing your cycling cap backwards so the visor can protect the back of your neck from the cold air and wind. Ear warmers or a fleece headband can help to keep your ears protected from the cold air if your other chosen head wear doesn’t provide it. If you’re going to be exposed to extreme wind chills, look into a balaclava to cover your head, face, and neck in order to protect against the cold wind. A balaclava made of relatively thin material can be easy to pull the lower portion down off your chin or pull it up over your nose. It can also help to avoid breathing in cold air. Have a look at a balaclava like this one. A waterproof helmet cover like this one will keep you drier and warmer in wet and very cold conditions, while minimizing the cold air that seeps in through the top of your helmet. A helmet cover serves to protect against the cold wind and the elements. If it starts raining or snowing, you’ll find yourself more protected. A helmet cover also offers a simple avenue to regulate your body temperature. If you find yourself getting too hot, you can easily snap off the helmet cover. But that might be one down side of a helmet cover – it doesn’t give your head as much room to breathe. Take a look at this helmet cover to see what you think. If you live in a very cold climate and you know you’ll be out riding regularly, you may also consider a winter cycling helmet. You may also consider a snowboarding or ski helmet. These types of helmets can serve as an alternative to protect your head and keep your head warm. These winter helmets also provide more insulation than your typical bike helmet, and generally are designed to be breathable and come with a form of ear covers to keep your ears warm as well. Here are some ski helmets. And then there are the eyes! Even if you feel it’s not bright enough outside for sunglasses, some form of glasses or eye protection is a good idea. You want to protect your eyes from the wind, cold air, and any debris that comes at you while you are out riding. Cycling through cold wind may cause your eyes to tear up, which in turn may reduce your visibility. So good eye wear to protect your eyes from the elements is important, even more so if you’re riding in cold temperatures. Glasses that curve around the face a bit can further help to protect your eyes against the cold wind. If it is cloudy or overcast outside, or you’re riding when it’s on the darker side, wear glasses with a clear lens. Some cyclists choose to wear ski goggles when it’s really windy or cold. This serves to protect your eyes as well. Just keep in mind if you choose to go this route that wearing ski goggles may reduce your peripheral vision just a tad. Take a look at this set for your cycling glasses. It comes with a few different lenses that you can switch out, including clear ones. No matter the type of winter cycling gloves or mittens you choose to wear in the winter, make sure your choice to keep your hands warm will allow your fingers to be mobile. It is essential for you to be able to safely control the brakes and gears when you are biking. Winter biking tip: When you’re out biking in cold weather, periodically shake out your hands to give a little extra circulation to your fingers. 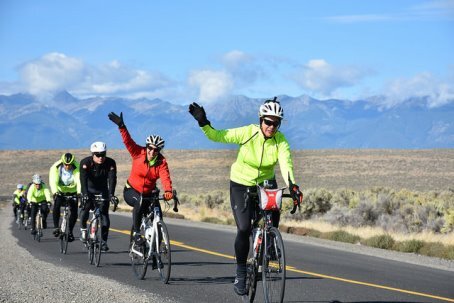 Are the regular winter gloves good enough to use to go cycling, or should you get cycling-specific winter cycling gloves? As always, the answer is… it depends! It depends on your preference – what does and doesn’t bother you, and what level of comfort you are looking for. Typically, cycling-specific gloves will be designed so the fingers and palms give you extra grip to prevent your fingers and hands from slipping as you are controlling your bike. The cycling gloves may also provide you with extra padding in the palm areas for additional comfort where your hand rests on the handlebars. Winter cycling gloves are designed with these things in mind. They are also designed with good insulation and to be breathable so it will minimize the effect of sweaty hands. Winter cycling gloves keep your hands warm in cold weather conditions to keep your fingers mobile so you can control your brakes and gears! For very cold weather conditions, it may be worth investing in a pair of lobster gloves like these ones. The split finger design helps to trap warmth by keeping your fingers close together. One of the original ideas behind the lobster gloves is that keeping your fingers together without any sort of separation will allow your fingers to stay warmer with the skin-to-skin contact of the fingers. But there are lobster gloves that provide individual fleece lining within the gloves. You can also combine these gloves with traditional thinner winter gloves to give an extra layer of insulation and protection from the cold elements. This could possibly be the warmest option for your hands, especially if you combine it with another option (or two). Handlebar mittens, or bike pogies like these, are mounted on to your handlebars. You insert your hands into the mittens and grab the handlebars as usual for full protection of your hands, wrists, and part of your forearm from the cold wind as the mittens act as a wind barrier. Depending on just how cold it is when you’re out riding, you can go without gloves with the bike pogies serving as your wind protection. Or if you feel your hands need extra protection from the cold, wear a pair of gloves along with using these handlebar mitts. If this looks like something you want to try out for your winter bike ride, be sure to look for the type of handlebar the mittens will fit for that is specific to your bike. Some will fit for a straight handlebar, like a mountain bike or hybrid bike, and you can also find some to fit drop bars for a road bike. Liner gloves are just as they sound. They are thin-layered gloves that provide a little bit of extra warmth for your fingers and hands. These types of gloves aren’t intended for really cold temperatures, but if it’s just chilly enough outside that the extra wind on your hands from riding makes your fingers cold, they could do the trick. Another use for liner gloves particularly when it comes to winter biking is as an added layer of protection to use with other types of gloves. Sometimes, the weather outside may just be a bit too cold for your standard winter cycling gloves, and wearing a pair of liner gloves underneath could be enough to keep your fingers warm. Liner gloves tend not to be a dependable source for being windproof or waterproof in very windy or very rainy situations. Take a look at these kinds of liner gloves. Now here is a sample winter cycling outfit decked out in cold weather cycling gear! Remember, depending on just how cold it is, you may want to add or remove layers or items to complete your winter outfit to suit the winter weather conditions you’ll be biking in. Also remember that people have different levels of comfort and adaptation to the cold, so think about how your body reacts to certain cold weather conditions to determine the best winter cycling gear for your bike ride. Affiliate links take you away for your browsing fun! You may have heard of Under Armour’s HeatGear apparel which helps to keep you cool and dry during your summer outdoor activities. Under Armour also has a winter version of ColdGear which can help to keep you warm and dry. This shirt works well as a base layer because of its properties that help to wick moisture from your sweat away from your body so it doesn’t leave you soaking in your sweat. It’s lightweight, comfortable, and breathable, which makes an Under Armour ColdGear long sleeve shirt an ideal base layer as part of your winter cycling outfit. There is both a compression and non-compression version of ColdGear long sleeve shirts. Under Armour has ColdGear clothing for women and ColdGear clothing for men. The purpose of the mid-layer is to act as an insulating layer traps the warmth and prevent it from escaping. Ideally you want this layer to be a little looser. The Under Armour Tech 1/4 Zip can be a part of your winter cycling outfit for this purpose. It’s lightweight and breathable, and loose fitting. This is a relatively thin shirt, and depending on how cold the temperature is, you may want to wear a breathable fleece type material in addition to, or instead of, this zip-up tech shirt. Alternatively, you may consider a non-zip version, which Under Armour also has as a tech long sleeve shirt. If the temperatures are slightly warmer, this Under Armour Tech 1/4 Zip long sleeve shirt can also be ideal to wear with a base layer and without a jacket. This type of shirt is great not only for your cycling apparel, but also as casual wear, so it can be dual purpose! You have a variety of colors to choose from, so you may even want to get more than one! Again, Under Armour has this for women and men: Tech 1/4 Zip for women and Tech 1/4 Zip for men. If the temperature is really cold, you may want to add additional layers. A breathable fleece layer like the Columbia Fuller Ridge Fleece Jacket can be a good choice. The key here is that the fleece is breathable. The jacket is made with special Polartec fabric which is optimal for winter biking as it provides comfort while being insulating, warm, and breathable. This means that even when you’re moving around a lot, it can help to prevent you from overheating. While you don’t want to get too cold when you’re out there biking in the winter, you also don’t want to get too hot! Once again, this thermal fleece jacket can serve dual purpose as clothing to wear even when you’re not cycling! It comes in a variety of colors to choose from. Columbia has this jacket for women and men: Women’s Fuller Ridge Fleece Jacket and Men’s Fuller Ridge Fleece Jacket. The Pearl Izumi Ride Elite Barrier Convertible Jacket can serve as a good choice for your outer layer to block cold wind when biking in the winter. The jacket is soft and breathable, and this Elite Barrier Jacket is a lightweight jacket that is easy to bike in, and it has convenient pockets. With your base layers and mid-layers, this jacket can complete your winter cycling outfit up top to keep your core warm. This jacket was designed with milder temperatures in mind, but if you wear it with adequate layers underneath, it can work well as the wind-blocking outer shell to keep you warm. This means you could also get more use out of the jacket by making it a multi-season jacket. The jacket can convert into a vest by removing the sleeves in warmer temperatures. In addition to being a reflective jacket, this cycling jacket comes in a variety of high visibility colors so you can be more safe out on the road! If you prefer not to have that bright yellow or bright orange, the jacket also comes in a black color, in which you will still get the reflective features. Pearl Izumi has this jacket for both women and men: Women’s Elite Barrier Convertible Jacket and Men’s Elite Barrier Convertible Jacket. Heat escapes through the head, so it’s important to have adequate protection for your head when you are biking in cold weather. The Baleaf Thermal Skull Cap Helmet Liner can work to keep your head and ears warm while minimizing the amount of sweat that builds up. This skull cap can easily fit under your bike helmet and is made with breathable material that helps to wick moisture from sweat away. It is also made with fleece to keep the heat in while providing comfort as you ride. To further stop cold air from reaching the head, something like the RockBros Helmet Cover can be helpful. A helmet cover can help to stop the cold wind that enters through the top of your helmet so that cold wind doesn’t cool down your head to an uncomfortable level. The helmet cover is elastic and simple to put onto your helmet. You can just as easily pull it off mid-ride if you feel that your head needs to breathe a little. While the helmet cover does work to keep cold wind out, it also works to keep moisture from your head’s sweat to escape. For some people, this may get a bit uncomfortable. The RockBros Helmet Cover comes in a few different colors, including a high visibility yellow so cars can see you when you’re biking on the road. Your gloves and how you protect your hands when you’re cycling in cold weather is an important consideration for your winter cycling outfit. If your hands get too cold, it can negatively impact your ability to brake and handle your bike safely. So be sure to take care to think of ways to keep your hands warm throughout your winter bike ride. The Pearl Izumi PRO AmFIB Lobster Gloves can help with that. These gloves are designed for temperatures in the 20s and 30s F and can keep your hands warm in these colder temperatures. They provide good warmth and insulation for most people on those cold winter bike rides. The added warmth and insulation does bring a bit of extra bulk to the Pearl Izumi PRO AmFIB Lobster Gloves, but it may be worth the compromise to keep your hands warm. When it’s really cold outside, the lobster gloves alone may not be enough to keep your hands warm. In these cases, it can be helpful to wear a pair of thin gloves like Smartwool Liner Gloves with the lobster gloves. These gloves are partly made from Merino wool so having them on those really cold bike rides can provide an extra layer of insulation and warmth. These Smartwool Liner Gloves could also be a handy pair of gloves to have even when you’re not cycling, so it can serve regular everyday purposes as well. As an added bonus, you have the ability to use your phone with these touch-screen capable gloves, so you don’t have to expose your fingers to cold air when you want to check something on your phone. Pearl Izumi Thermal Cycling Tights are a good choice for your legs on cold days. You don’t want to increase your chances of getting one of the common cycling injuries because of muscles and joints of your legs that are too cold or not warmed up enough. This makes having adequate warmth for your legs quite important. These cycling tights are generally good down to the 40s F, and anything lower in temperature, you will likely want to add an extra layer to your legs. These Pearl Izumi Thermal Cycling Tights provide comfort through their moisture-wicking properties while providing warmth through their thermal properties. As the tights are cycling-specific, they are padded tights for added comfort while you are biking. These tights would make a good addition to your winter cycling outfit! Pearl Izumi carries thermal cycling tights for both women and men: Pearl Izumi Women’s Sugar Thermal Cycling Tights and Pearl Izumi Men’s Select Thermal Cycling Tights. When the cycling tights don’t keep your legs warm enough on those super cold winter days, the 4ucycling Windproof Athletic Pants can act as winter cycling pants to make you and your legs feel a whole lot warmer. They are designed for the active person doing outdoor activities, so they provide good flexibility while allowing your legs to breathe. The cycling pants are lined with fleece to keep you warm with thermal elements as you bike through the cold temperatures and can be ideal to wear down to the 20s and 30s F.
These 4ucycling Athletic Pants also have some reflective elements, and it’s always good to have any extra help to be seen when it’s starting to get dark! For your feet, the DeFeet Woolie Boolie Socks that are 6-inch tall socks can help to keep your feet warm when you’re mountain biking on the trails or cycling on the roads. Even if your summer riding has you in ankle socks, with winter biking you may want to consider making a change to wear taller socks. In addition to providing warmth for your toes (very important! ), you also want to provide adequate warmth for your ankles so they don’t get too cold in the process of biking. So ideally your socks would help keep your feet and ankles warm. This means that you want to make sure to include a good quality pair of tall socks as part of your winter cycling outfit. The DeFeet Woolie Boolie Socks are made with Merino wool and they are durable. Also be sure to adjust your cycling shoes if you end up wearing socks that are thicker than your usual cycling socks. To further protect your toes, you can give the Pearl Izumi Ride Elite Thermal Toe Covers a try. Along with your fingers, your toes are among the most vulnerable parts of your body to the cold, and you want to take care as to keep your feet warm. Warm socks are a good start. But if you’re biking in really cold temperatures, and combine that with the wind exposure your feet get, it may not take long before your toes start feeling the cold. So to provide your feet with more warmth, there are toe covers and shoe covers that fit over your cycling shoes. There are basically two kinds of covers: one kind covers your entire shoe, and the other kind covers your toes.